Even at 12000feet water boils at 189 F; too hot to drink. But pasta, rice or potatoes sure take longer to cook. I screwed up 3 minute eggs once while camping at 11,000 feet. I live at 7500 ft, so you'd think I'd realize that. Also, I blame the altitude for any huffing and puffing I do on my annual hike each year! When we get up to around 8500 feet water is no longer hot enough to get a good brew according to the temperatures mentioned above. Home is now at 8800 feet. I guess it is a good thing that I discovered the cold brew process years ago and grew to much prefer cold brewed coffee. Guess I'll get thrown out of the coffee klatsch for this, but when camping, we take instant. I used to use an instant, too! Bustello! For me, camping is a time to relax, to take things easy, as well as hike, see things and enjoy myself. My cold brew coffee fits right in. The concentrate is made at home, diluted 1:3 to drink. Taking it easy also means eating meals I made ahead of time at home and reheating. Back to the OP and the theme of mountain camping... 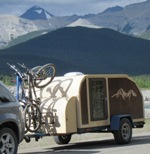 Most of my camping has been in mountain areas. I long ago learned that the seasons in the mountains do not necessarily follow the calendar. One should have clothing that can be layered well. We even carried 2 sleeping bags when car/truck camping. And yes, I feel the cold a little more as I have aged (72 two days ago). Good thing I live at 3750 feet. Perfect for making coffee & I am addicted. One thing I really dread about early and late season camping is climbing under the covers onto a cold mattress. It can take a very long time to warm the mattress with body heat. Many years ago I received a 12V electric blanket as a gift. I plugged it in but couldn't feel any warmth from it so it has been gathering dust on a shelf in the garage. Awhile ago I was revising the program that logs temperatures on a pizza oven and decided to do a couple experiments with the thermocouples. I put the 12V blanket under the covers next to the mattress with a couple of the thermocouples and one monitoring the outside air temperature. Here is the result. After a couple hours the temperature next to the mattress was up by about 10C or 18F. Not hot by any means but a lot of heat that the body wouldn't have to provide. This uses about 3.5 amps so can easily be plugged into the cigarette lighter for a few hours with no worry of draining the battery too much. I also tried a 250 watt 120V heater and the upper 3 lines here show the result. The lower two lines show the outside air temp and the 3 upper lines the inside air temp. The top line was about a foot over the bed and the other two lines on top of the bed covers. This heater uses more than 6 times the power, and even more if being converted from 12V to 120V. I gave up on it as it would be no use without shore power. I haven't used the 12V blanket for camping yet, but I will this fall. The best thing for cold weather camping. Just as long as you have some one to share it with. I really liked spooning on 20 degree nights. Not a big fan getting out of the bag in the morning to get the heat the water for tea while someone stays snug-as-a-bug. 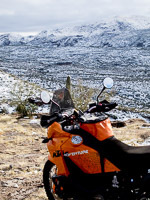 KTM_Guy wrote: The best thing for cold weather camping. Just as long as you have some one to share it with. I really liked spooning on 20 degree nights. Not a big fan getting out of the bag in the morning to get the heat the water for tea while someone stays snug-as-a-bug. I have a big NEMO Mezzo Loft Luxury 30 Sleeping Bag, it'll fit two if needed. Then again my partner in crime is only 5'1" and maybe 95 lbs. It was below freezing outside but I ended up being too warm, she was perfectly comfy. I will pass on a woman to camp with after my exs kinda ruined my attudes on romance.its nice to no longer have belly aches from the stress and eat milk again and not be chewed out and faceing a mad lady 24 7.naw...kinda no longer rushing marrage or worrying about romance..for heat i got 3 quilts inside my tear..and a 12 volt road pro heater 300 watts and a 12 volt electric blanket and 2 inches of foam insulation and as a cowboy years ago I learned to sleep even with my spurs on fully clothed in the winter time.....probaly take under shirts,.long handles and sweaters,with me to pinedale its high elevation...tuesday wyoming has snow in the forecast for June in our moutains.kinda normal out here ..in my moutains I boil my coffee the grounds floating on the water.no issues. In 2016 at walk the winds I boiled for 2 hours a hole big pot of pinto beans.on a Coleman stove..slowcowboy.